We all know that travel is supposed to broaden the mind but our reliance on the internet is helping to undermine an old adage which, anyway, was always a little suspect. So much information and so many images pre-approving what ought to be seen is almost guaranteed to produce not just déjà vu but a disappointing sense that the first-hand experience is somehow not quite as sharp as the second-hand, digitized one. The pyramids of Egypt or the Eiffel Tower may turn out to look less iconic than anticipated, as viewing places already privileged for spectatorship sometimes fails to cut the ice. Malawi is not like this; Malawi is different. Leaving Malawi’s airport and driving through the outskirts of Lilongwe, the country’s capitol, I first begin to feel the absence of familiar landmarks while travelling down a street lined with grand red-mahogany trees and intuiting what was not present: traffic lights, convenience stores and the like. Instead of mesmerizing advertisements for those electronic devices without which, we are being led to believe, life is just pointless, there are plain posters of what looks like beer bottles labelled Kuche Kuche. The lack of reassuring familiarity is ever so slightly unnerving and a sense of porousness takes shape when heading south on the main road and Mozambique comes into view mere metres away from the tarmac. No fencing or border markings, no Schengen-style Agreement, and no surprise to learn that Malawi-Mozambique marriages are not unknown in this region of the country. On arriving at Ku Chawe Inn in Zomba, the country’s former capitol, picturesque smiles from the staff only make me think what a grumpy old traveller they are greeting. I need to be mollified and head for the bar to ask about Kuche Kuche (‘up until dawn’), the beer’s low alcohol content suggesting you can drink it all night without ill effect. What could be the ideal solution to jet lag beckons. Proper mollification comes with the comprehensive breakfast spread the next morning, bettering by far the typical hotel offering. Malawi’s magic then shifts into a higher gear when a jeep ride up to Chingwe’s Hole on the Zomba Plateau reveals a lateral stretch of scenery that, bizarrely, brings to mind those background landscapes in early Renaissance art: etched mountains, brown and green plains, the grey, pencilled line of a misty river – but for real, right in front of me and on a scale that dwarfs any canvas. I feel like Dr. Livingstone (who explored Malawi’s Shire river in the 1860s) confronting a vast wilderness, moved to wonder about the source of a mighty river, drawn in by the strange beauty of a foreign land. I gaze at a flat top acacia tree in the distance. Half way down from Zomba Plateau lives John Wilson, a Suffolk man who came to work in Malawi decades ago and never left. Now retired, his one-hectare garden backs onto indigenous, mid-altitude evergreen forest, which attracts a rare and remarkably beautiful warbler, the White-winged Apalis (chrome yellow belly, black upperparts, an orange chest and a white throat). John points to a pair in one of the trees they favour, the kind of tree that has been so extensively cut down for fuel that only about 50 pairs of these birds still survive in the country (and precious few elsewhere in Africa). It takes two hours to reach Mvuu Lodge in Liwonde National Park and the final stage, crossing the Shire River, had me tingling with excitement at the sight of a hippo’s head poking just above the water like an unwieldy and misshaped periscope and then by the giant face and flapping ears of an elephant idly bathing close to the boat. This it turns out is just the inaugural movement in an unsurpassed symphony of scenery and wildlife and, upon disembarking, I am astonished by the bird life at the water’s edge: the polyandrous African Jacana picking at water lilies, a Squacco Heron standing motionless close to a Spur-winged Goose – common residents in Malawi but visual music to the first-time beholder. Over the next two days — encompassing early-morning walks, day- and night-time jeep rides, boat safaris on the river – I am immersed in African wildlife by being brought close to delicate impalas, endearing but far-from-handsome warthogs, zebras at a watering hole, spiral-horned antelopes with Red-billed Oxpeckers removing the ticks on their backs, and exotically coloured birds appearing everywhere. It’s fine by me that Malawi lacks big predators like lions and leopards, having no desire to test my mettle in their presence, and watching African elephants guarding their young is a sufficient encounter with big mammals. Mvuu Lodge has a lot going for it, especially the bush trips before dusk when the jeep stops and gin and tonic from a cooler are laid out on a small table. 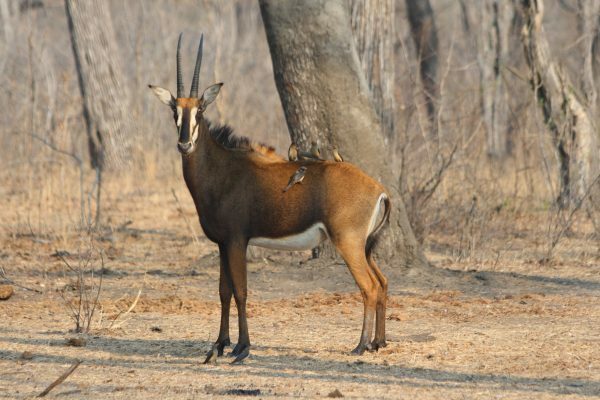 Standing in the savannah, watching the sun go down as bushbucks forage under trees and a group of clamorous Hadeda Ibis fly overhead with their braying ‘ha-ha’ha’ call, is my kind of African experience. 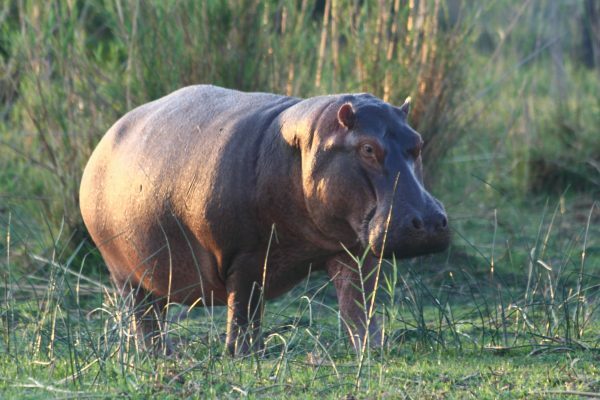 What makes Liwonde National Park very special is the presence of the Shire river; gliding over its gentle current with binoculars ready is a natural antidote to the leaden times we live in, especially when gargantuan hippopotamuses (vegetarians despite spending most of their time in water) are spotted clambering onto land. After feeding they clumsily but sportively hurl and splash themselves back into the river, like grossly oversized children jumping into a pool. No such sense of play can be associated with the sight of squamous crocodiles slumbering on the banks; I fear their presence and half-lidded eyes, turning away to revel instead in the riot of aquatic birdlife: the dazzling Malachite Kingfisher, the pure colouring of the African Sacred Ibis, a Goliath Heron spreading its wings to bicker with an African Fish-eagle. I departed Liwonde with reluctance, feeling this was as good as it gets, but what a surprise to arrive at Pumulani Lodge at Lake Malawi and, slipping effortlessly into beach-resort mode, enjoy the cherry on the sundae: recliners on a sandy beach, dawdling on a dhow cruise, safe swimming in the lake, kayaking and snorkelling. Still, though, I was up at dawn for one of the bird watching walks for which Pumulani Lodge provides a knowledgable guide, and gratified when hornbills and species of Roller and Bee-eater were pointed out that I had never previously seen. 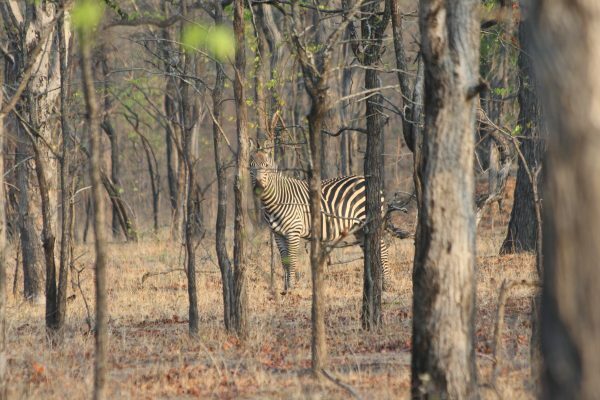 Malawi is the perfect destination for travellers who yearn for a safari holiday but hold back from the big game hype sometimes used to promote them, harbouring the suspicion that while following a trail of 4×4 vehicles through savannah would not be hokey neither would it constitute the ultimate wildlife experience. 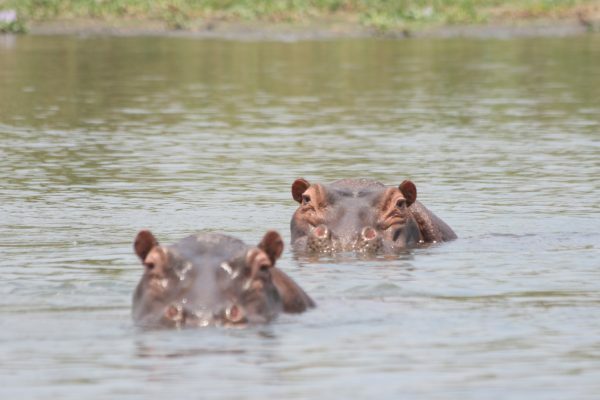 To enjoy a Malawi safari at its most authentic, my advice is to choose a reliable African travel specialist like Mahlatini (mahlatini.com) and use local operators like Wilderness Safari (wilderness-safaris.com) and Robin Pope Safaris (robinpopesafaris.net). There are no direct flights from London but Kenya Airways (kenya-airways.com) operates daily services from Heathrow to Nairobi and daily connections on to Lilongwe. For reading, start with Bradt’s travel guide to Malawi and the same publisher’s Southern African Wildlife; for an overview of what the continent offers check out Africa’s Top Wildlife Countries by Mark W Nolting. Another part of Malawi’s magic is the opportunity for actually experiencing some of the country outside the bubble of tourist lodges and camps. Pumulani, for instance, provides bicycles for rides through the local countryside, while the journey from Liwonge airport to Zomba opens up a cross-section of the country’s everyday life: cyclists and pedestrians outnumbering vehicles; roadside vendors selling cartons of Chibuku beer, made from fermented maize and tasting like porridge with a punch; subsistence farmers caring for their maize and cassava; DIY kilns for firing the mud bricks with which people build their homes. G. K. Chesterton said that the point of overseas travel is not to see other countries but to see one’s own for the first time – ‘it is at last to set foot in one’s own country as a foreign land’ – and coming back to London from Malawi certainly proves him right. Kenya Airways operates daily services from T4 London-Heathrow to Nairobi with daily connections to Lilongwe in Malawi.